CCP leader’s doctrine of iron dictatorship and China’s “great power” status is enshrined in party constitution – but is this a recipe for stable rule? The 19th Congress of China’s ruling Communist Party (CCP) held in October, which confirmed China’s transition to one-man dictatorship under Xi Jinping, was the most significant CCP congress of this century. This has major implications for the future not just in China but globally. The congress was utilised as a global stage for Xi to showpiece his Mao-like dominance over the party-state apparatus, but also a supposedly revitalised CCP regime’s total control over “party, government, army, people, science, East, West, North, South and Center” (from the amendment to the CCP’s constitution as carried unanimously at the congress). Also, and crucially, the congress was designed to send a triumphalist message of China’s unstoppable rise as a global superpower. Based on purchasing power parities, which adjust exchange rates to take account of national price variations, China’s economic output (GDP) is already 15 percent larger than the US, and on current trends will be 50 percent larger by 2023. A huge shift has already taken place in perceptions of China worldwide with 46 percent of Britons and 41 percent of Germans saying China is the world’s top economic power according to Pew Research. Only 31 percent and 24 percent respectively believed the US still held the number one spot. China’s growing global influence is shown in such far flung events as the Zimbabwean army’s ouster of Robert Mugabe, and Prince Mohammed bin Salman’s ‘coup’ against his rival princes in Saudi Arabia, which is clearly inspired by Xi Jinping’s purge of the CCP. Xi’s pseudo-theory of “Socialism with Chinese characteristics for the new era”, now formally enshrined along with the leader’s name into the CCP’s constitution alongside Mao Zedong Thought and Deng Xiaoping Theory, is an ideological defence of Chinese nationalism, authoritarian rule and state capitalism. It displays booming self-confidence in its prediction and justification of Chinese imperialism, of course not so described, which Xi said is “approaching the centre of the world stage” as the former US-led global order faces irreversible decline. The outcome of the congress – the cementation of Xi’s power – was fully expected. But does the regime’s self-image of an increasingly powerful dictatorial state led by its “strongest leader” in more than 40 years, relentlessly sweeping aside all opposition at home and abroad, really match reality? Socialists believe reality both in China and globally is far more complex, with unprecedented challenges on the horizon: sharpening international tensions, explosive inequality in China and major economic shocks. Rather than a real congress, with delegates and votes, the CCP’s most important twice-a-decade gathering amounted to a tightly choreographed coronation ceremony for Xi, who possibly now becomes “emperor for life” according to Hong Kong-based China scholar Willy Lam. The purely decorative character of this meeting is of course not a new phenomenon in the history of the CCP and other regimes with a Stalinist past, but the 19th Congress perhaps set a new record. The so-called delegates were little more than hired extras in a gigantic pageant. 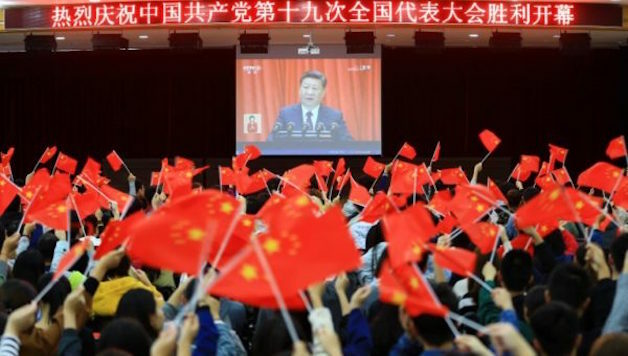 Those interviewed by the media infallibly offered accolades to the leader, while schoolchildren nationwide were forced to watch Xi’s three hour and 20 minute speech on television. The social media hashtag “19thPartyCongress” was viewed 1.19 billion times on the meeting’s opening day. Should we be impressed? Such feats are a cinch for a regime with unparalleled dictatorial control of the media and internet. Confirming the shift to increasing repression and control, even within the top levels of the party-state, Xi has abandoned the notion of ‘intra-party democracy’ that was pushed somewhat lamely by his predecessors Jiang Zemin and Hu Jintao to establish some institutional balances in the workings of the CCP. The consultative ‘straw poll’ of delegates conducted at the last two congresses (with no results ever published), to gauge views on the selection of the top leadership – the 25-man Politburo and seven-man Politburo Standing Committee – has been jettisoned by Xi Jinping. The congress was therefore even more of a rubber stamp than previously, with all essential business thrashed out many months previously through informal channels involving key figures including retired CCP patriarchs and top generals. According to a Xinhua report this involved some 57 elite individuals who Xi consulted before making his ‘election’. The reinforcement of Xi’s position was shown by the consecration of his personalised ‘theory’ into the constitution and his break with the established succession rule – a key constraint on the power of his predecessors. With no designated successor in the new reshuffled leadership, a situation that has not existed for decades, the door is open for Xi to extend his rule, directly or from behind the scenes, after his current term ends in 2022. While the make-up of the new Standing Committee reflects a degree of factional balance in the name of ‘party unity’, this is largely because this formerly omnipotent organ is a significantly weaker entity under Xi. In past leadership configurations the designated successor came from a different faction to the incumbent leader, as when Hu Jintao (Young Communist League faction) followed Jiang Zemin (Shanghai Gang). This was another of Deng Xiaoping’s innovations to implant consensus-based structures as a way to regulate the conflict between factions and prevent too great a concentration of power in the hands one leader or leading group – which under Deng’s system could be undone by the successor. This was ‘one-party’ dictatorship but not ‘one-faction’ dictatorship. Xi has dismantled this and most other internal constraints. The two politicians previously seen as leadership contenders in 2022, former Chongqing party boss Sun Zhengcai (close to Shanghai Gang) and Guangdong boss “Little Hu” Chunhua (Young Communist League), have been side-lined by Xi. Sun was swept away by the anti-graft campaign in July, and now stands accused of heinous crimes and plots. His fellow officials in Jilin province, where Sun served as party chief until 2012, now accuse him of “ignoring the development of Jilin and thinking only about his political future”, although this was clearly no obstacle to his unanimous ‘election’ to the Politburo at the 18th Congress in 2012. Xi’s concentration of personal power takes the Chinese dictatorship in a dangerous direction. That his sharp break with the collective leadership model of the past three decades has largely won acceptance within the CCP’s ruling circles is a measure of their sense of desperation and approaching crisis behind the façade of triumphalism. This is a ruling elite placing their hopes in a strongman to lead them through the minefield of major economic, social and geopolitical challenges. As The Economist (October 14) reported, “Mr Xi was appointed to save the party. The notion that the Communist Party might need saving will sound peculiar.” To socialists and close followers of events in China this does not sound peculiar. The old ‘dictatorship by committee’ approach was developed by Deng Xiaoping in the 1980s to offer a measure of internal stability and balance within the regime’s leading summits in the absence of the ‘safety valve’ of bourgeois democracy with its competing parties and elections. While bourgeois democracy has also entered into an era of crisis and dysfunction as class pressures boil up, one of the differences between this system and China’s authoritarian capitalism, apart from the crucial difference from the standpoint of the working class in the opportunities that democracy avails for workers’ organisations and political ideas to develop and fight for influence, is that it offers capitalist rule a degree of flexibility – “checks and balances” – that are lacking in a rigid dictatorial system. Capitalist ‘democracies’ with their ability to replace ruling parties and sometimes to use elections to defuse class pressures have experienced serious political and economic crises but without the old order necessarily crashing down – unless there is a clear political alternative offered by the workers’ movement. But the very idea of a major economic crisis in China fills the ruling elite with dread because they understand that, as in 1989, this can pose a direct challenge to the entire system. Xi has largely dispensed with the internal safeguards, imparted by Deng, in his quest to centralise (to Beijing over the regions) and personalise (to Xi over his fellow leaders) power within the state. But by reducing the power of the Standing Committee and downgrading his peers all the pressure is focussed upon the ‘core’, i.e. Xi Jinping himself. “Build the party around one man and he falls, then anything is possible,” noted investment banker Robert Blohm. It is notable that the image of Xi as a strongman which has been meticulously fostered by China’s billion-dollar propaganda machine, has also largely been parroted by the ‘free press’ of the capitalist world. US magazine Newsweek reporting on Xi’s “re-election to a second five-year term” is just one example of how the mainstream capitalist media have adapted their China coverage to fit the regime’s narrative. Do a Google search for the English words “Xi Jinping election” and you will get 20 times as many results (8.6 million) as a search for “Xi Jinping dictator” (395,000). This political subservience is reflected in the failure, consistently, of ‘democratic’ capitalist governments to speak out over human rights abuses and repression, which have markedly increased under Xi’s rule. The diplomatic silence of Western leaders over the death from cancer of liberal dissident Liu Xiaobo – the first Nobel laureate to die in prison since Nazi times – is a case in point as is the continued brutal persecution of his widow Liu Xia. On previous US presidential visits a minimal perfunctory point was often made to take up one individual case – a dissident or prisoner – with the Chinese leaders, before getting down to the real business of signing economic deals. This ritual was negotiated in advance by both sides. Trump, on his November state visit, completely dispensed with this ‘human rights’ charade. But this is part of a wider pattern showing the authoritarian sympathies of international capitalism in an era of acute crisis. We advise our readers to treat with scepticism such epithets as “most powerful leader since Mao Zedong”. Xi’s victories remain exclusively within the realm of the elite-level factional struggle and the governmental and military bureaucracy (even here he will continue to face checks and challenges). Xi’s power is engineered from the top down through his control of propaganda (the media) and the security-police-military apparatus. In the immediate aftermath of the 19th Congress, the regime is enjoying a political ‘honeymoon’ effect similar to that in Western countries after an election. But this is unlikely to last for long. Xi’s success is based not on genuine mass support, it is far more shaky than most commentators recognise. Through unprecedented repression, a media-driven personality cult, and an anti-corruption campaign that has been used to terrorise the ranks of the CCP officialdom over the past five years, Xi’s rule is more consolidated than his predecessors Hu and Jiang. But this is not comparable with the mass support, albeit on a very contradictory basis, that existed for Mao and his successor Deng Xiaoping. In Mao’s case this support rested on far-reaching social and economic change made possible through an extremely distorted and bureaucratised but in terms of scale unparalleled social revolution. Deng’s social base rested on the exhaustion and disillusionment of the masses with the Maoist regime in the 1960s and 70s, and among the vast rural population upon the early economic gains from Deng’s market-based rural reforms (de-collectivisation and privatisation). The power of Xi’s ruling group has not yet been tested against any real opposition, whether by the masses, or in a major international conflict. Rather, Xi’s rise to dominance reflects the impasse of the CCP regime, which has for a long time sensed catastrophe unless it can radically change course – especially to break the economy’s dependence on monster levels of debt. The centre’s historical inability to impose its polices on China’s disparate regions is the crux of the problem, which Xi wants to solve through a forceful re-centralisation of power. China is still in many ways a contradictory collection of provincial economies, some of which are giants in their own right. Guangdong, Jiangsu and Shandong would as independent nations rank among the 20 biggest economies in the world, each significantly larger than G20 members Indonesia, Turkey and Saudi Arabia in GDP terms. Xi’s attempts to stare down entrenched regional elites is an additional reason for his harder line against Hong Kong and Taiwan, and the regime’s disproportionate obsession with Hong Kong’s pro-independence groups. The loudest applause of Xi’s congress speech came for his statement, “We will never allow anyone, any organisation, or any political party, at any time or in any form, to separate any part of Chinese territory from China.” The increased political repression in Hong Kong is in part a proxy struggle for Beijing’s power over the provinces and their economies. Xi’s consolidation of absolutist rule has benefited from ‘tailwinds’ as far as the international situation is concerned, although this can change dramatically in the next period. Despite a generally low-key and non-confrontational Asian tour, Trump and US imperialism are renewing efforts to build a ‘Quad’ alliance together with Australia, India and Japan with the aim of pushing back against China’s dominance in Asia. On his five-country tour, Trump and his officials spoke repeatedly about the “Indo-Pacific” region – a terminological switch that denotes a change of political strategy. The onset of the capitalist crisis ten years ago and with it the slide into political dysfunctionality of a great many capitalist ‘democracies’ (most strikingly the US, but also post-Brexit Europe) have – by default – benefited Xi’s agenda. The mind-blowingly unstable and inept Trump administration has up to now given an enormous boost to the Chinese regime’s global ambitions, and allowed Xi to project himself as an ‘anchor of stability’ for world capitalism particularly in Asia but also beyond. This led CNN to proclaim that China had “won 2017” in geopolitical terms. The Xi regime has leveraged this elevated global prestige for domestic consumption as an additional plank of its Chinese nationalist propaganda. What is the ‘Communist Party’? The CCP is of course not ‘Communist’, its politics today are right-wing, nationalist and pro-capitalist. Nor is it really a ‘party’ despite boasting 88 million members – a figure that is outstripped by India’s right-wing nationalist BJP, which claims 110 million members. In China, the state and party have merged into one gigantic dictatorial colossus with the ‘party’ controlling the government, the army, the judiciary, the security apparatus, the media, cyberspace, and decisive sectors of the economy through its control of ‘pillar’ SOEs (State Owned Enterprises). Separate out the CCP and the state will almost certainly collapse. This also explains the allegiance of the capitalists – in China and globally – to the current CCP regime. With the exception of a small minority of ideological zealots, world capitalism does not want the collapse of the Chinese state which has become so decisive for its profits and economic prospects on a global scale. China now has more billionaires in US dollar terms than any other country, 647 compared to 563 in the US. According to the Shanghai-based Hurun list, China now has 36 percent of the world’s billionaires. Significantly the number of billionaires has more than doubled (from 251) since Xi Jinping came to power in 2012. Three of these billionaires – Li Denghai, Wu Shaoxun and Pan Gang – were delegates to the CCP Congress. A Peking University study last year revealed that the poorest 25 percent of Chinese households (around 342 million people) own just 1 percent of the country’s wealth. The richest 1 percent (around 13 million, mostly CCP-connected) own one-third of the wealth. This is a true gauge of the brutal class content of the CCP’s policies even if there are significant differences compared with the fully-liberalised model of free market capitalism typical of Western capitalist societies. Chinese capitalism hasn’t and is unlikely to ever adopt that model. The past decade of global economic crisis and Western capitalism’s relative decline have reinforced the conviction of China’s rulers that their form of capitalism is superior. In as far as it represents any coherent ideology this is what ‘Xi Jinping Thought’ means. The most crucial distinguishing characteristic is the refusal of the Chinese elite, organised within and around the CCP dictatorship, to surrender its exclusive political control or to share power by importing ‘Western democracy’. For this reason the CCP insists on retaining its hold over key economic levers. Xi’s rule has reinforced these features of the regime and dramatically stepped up the ideological struggle against ‘Westernism’. This is also shown by the promotion of Wang Huning, a veteran CCP ‘theoretician’ to the Politburo Standing Committee. Wang is China’s equivalent of the American ‘neo-cons’ – expounding nationalism, authoritarianism and imperialism. His elevation and his fellow members of the new Standing Committee signal a shift by Xi from a technocratic leadership towards a more ideological one. Heightened nationalistic ideology linked to increased repression and authoritarianism is a rising global trend. It is widely speculated in overseas media that with Xi now firmly in command his second term will feature a greater push for market reforms. This is not the most likely perspective. In 2013, when Xi and Co unveiled a long to-do list of economic reforms to the applause of global capitalism, we warned that irrespective of the subjective wishes of the CCP leadership there were powerful in-built factors in China’s economic and political structure that meant many of the promised reforms might not materialise. The main slant of Xi’s economic policies are likely to remain as now, to refine and strengthen state capitalism, which includes harnessing private and foreign capital but under “controlled” forms. But with foreign capitalism increasingly disappointed about the slow pace of market opening and liberalisation, Beijing will attempt to strike a balance employing economic carrots and sticks. It is therefore possible some elements of Xi’s largely comatose market reform agenda could accelerate in the next period partly as a concession to the pressure of foreign capital and partly because the Chinese regime needs to attract more foreign capital especially into its bond and equity market to lighten the debt load on the Chinese banks. Another factor is the regime’s fear of de-globalisation and protectionism, which are on the rise everywhere and could wreak havoc on China’s economy. As we explained, Xi’s anti-corruption campaign was primarily a political tool to facilitate his consolidation of power, rather than a fight against corruption which is endemic in the current state. This campaign has been the single most trumpeted achievement of Xi’s first term, with a reported 1.4 million high and low-level officials (“tigers and flies”) investigated and around 170 senior government officials and 60 generals brought down. However, in most cases the result has meant minor punishments, dismissal or demotion, with less than 10 percent facing criminal action. Significantly, with the single exception of Bo Xilai, who was arrested during the reign of Xi’s predecessor Hu Jintao, no member of the CCP’s hereditary nobility, the princelings, has been ensnared by Xi’s campaign. This of course points to a behind-the-scenes deal to placate the princelings which otherwise would risk triggering a factional fight to the death. This brings us to the one obvious ‘wrinkle’ in Xi’s otherwise flawless 19th Congress – the departure from the leadership of his closest ally and anti-graft tsar Wang Qishan, who at 69 years old was forced to retire. There had long been speculation that Xi would break the unwritten retirement rules and keep Wang on board, a move that would also set a precedent thus easing Xi’s own path to an unprecedented third term in power in 2022. Given the ‘black box’ character of the CCP, we cannot say for sure what has happened in Wang’s case. It seems he was sacrificed by Xi in the interests of “party stability” and in exchange for securing more important objectives. Wang, ironically or not, was singled out by the maverick exiled billionaire Guo Wengjui in his anti-regime campaign as an especially corrupt figure who has allegedly channelled vast sums overseas. Some now speculate that Guo’s accusations have hit their mark. Perhaps more likely is the theory that Wang’s ruthless reign as anti-corruption boss drew a backlash from within the elite. A report in the Nikkei Asian Review says there was even opposition inside the Central Commission for Discipline Inspection (CCDI), Wang’s power base, to keeping him on board. Other reports suggest Wang was squeezed out just a couple of weeks prior to the 19th Congress at a key meeting between Xi and party elders. Possibly the anti-corruption will now scale down as Xi seeks to rebuild some bridges within the elite. The CCDI will be reformed to give it a more formal status as a state entity. But it will remain the main political weapon for Xi to exercise his control and neutralise resistance within the party-state apparatus. Rather than overcoming the tensions within the Chinese state and elite, which in the final analysis reflect powerful contradictions at society’s base, Xi’s elevation opens a new phase, a high stakes gamble, that is full of risks for Chinese capitalism and the authoritarian state. The foundations of his rule – historically unprecedented levels of debt and financial speculation, intensified police terror, and ramped up nationalism – constitute a succession of crises waiting to happen. The next period will also undoubtedly see the giant of Chinese labour, 800-million strong, rise and “approach the centre of the world stage”. Our task is to build support for the programme of genuine socialism and working class internationalism with which to transform China and the world.